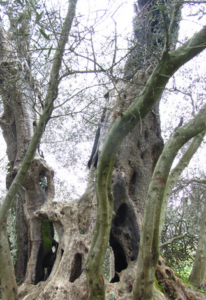 The two thousand year old tree, is located in a particularly suited to olive growing area, where other plants of considerable size are present (although none reached its height). Studies to determine the age, through the technique of carbon-14, were carried out by the University of Perugia and the CNR studies have examined the genome of the plant and the like in the area, to determine accurately the variety. The tradition still alive in Semproniano remember that, to collect dell’Olivone olives, needed three flights of stairs, that those who picked the olives did not come down to the ground even for lunch, staying to eat on the branches of the plant, and that, in years more favorable, the Olivone came also to produce 8 tons of olives. 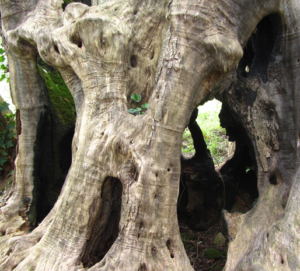 Even after the damages suffered by lightning, which had reduced the size of about 3 meters, before the serious fire suffered in 1998, reached the tree, with one of the three main branches, the height of 21 meters.